Almost everything on the Wii that involved the internet was really, really odd. Game specific friend codes? Redundant. Wii Speak Channel? I never knew anyone who used it. That weekly news/advertising/propaganda segment Nintendo Week? Cheesiest show ever (I secretly loved it though). The list goes on and on. But out of all of this chaos, insanity, and stupidity, one bit of brilliance shone through. Now, it wasn’t without it’s flaws. But it laid the groundwork for Nintendo’s digital future and was pretty amazing in and of itself, if you dug deep enough into it. So let’s dig in to this under-appreciated part of last generation. Backwards compatibility is a wonderful thing. You can upgrade to a new system and still play all the games you already own. The last generation of gaming was no different: every major console had at least some form of backwards compatibility. But backwards compatibility typically only goes back one generation. So what do you do when you want to play a game from, say, two generations ago? The WiiWare section of the Wii Shop is bizarre, but in the greatest way possible. Games like Cave Story and World of Goo are sold in the same place as games like Fast Draw Showdown. There’s a lot of crazy stuff in there along with a bunch of original games by Nintendo. Oh, and those crazy games? They’re just as much of a blast to play as they are insane. Take, for example, Tomena Sanner. It’s a rhythm/twitch-action game about a businessman who, while racing to get to work on time, has to avoid everyday things like dinosaurs and robots. It’s a good bit of fun, so go ahead and look into it if it sounds like your kind of thing. But something really interesting is that, even though nobody was watching, WiiWare was quietly filling up with great indie games. I already mentioned Cave Story and World of Goo, two indies that had PC versions but, on the console side of things, were only available on Wii. World of Goo’s controls on Wii are even arguably superior to those of the PC version. La-Mulana was a latecomer to WiiWare, but was similarly only released on Wii and PC. The excellent Bit.Trip series got it’s start on WiiWare and, in my opinion, plays best with a Wii Remote. Maybe the most important thing that the Wii Shop did, though, was give Nintendo some much needed practice at running an online store. It taught them what kinds of digital content sells and how it needs to be priced. For instance, their next online store (the DSi Shop) was full of excellent, bite-sized games at budget prices. I even think that the 3DS and WiiU eShops show how much Nintendo learned from the Wii Shop. The great aspects of the Shop Channel, like the Virtual Console and the plethora of imaginative new Nintendo IPs, have been carried over into their new storefronts; additionally, Nintendo has clearly learned from some of the Wii Shop’s failings by removing the inexplicable separation between classic games, recent releases, and applications and instead putting all of the eShop’s downloads together. 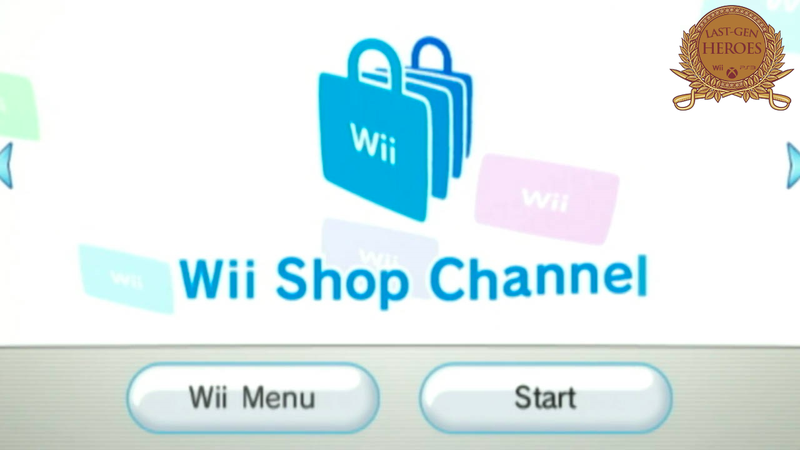 While it may not seem like it at first glance, the Wii Shop Channel was a really big deal for Nintendo. Their first foray into digital distribution was a hidden gem filled with classic games and exciting new titles. It was also the home of some pretty great indie games. Nintendo went into the next generation with conservative but steady footing in a digital marketplace. That’s why I believe the Wii Shop Channel is a Last-Gen Hero.